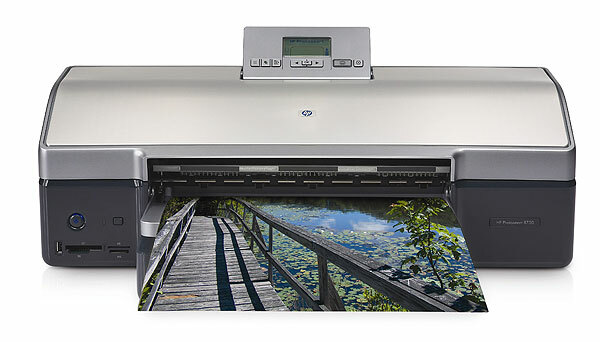 We use now a HP 8750 for our portfolio proof prints. 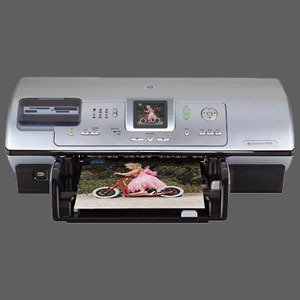 Today at PMA 2005 the big brother HP Photosmart 8750 Professional Photo Printer was announced (prints up to 13x19"). The 8750 also features new improved ink cartridges for HP 102 Gray (B/W prints) and HP 101 for better nature blue rendering. Download the HP fact sheet from here. We recently started our rview diary about the HP Designjet 30/130. Like its big brother (the 8450 only prints up tp letter size) the HP Photosmart 8450 claims (actually backed up by Wilhelm Imaging Research) longevity on HP Photo Plus Glossy and Soft Gloss papers. We have no intention to check this printer with any matte papers as we wind the HP printers are at their best with glossy media. Note: we are only interested in the HP 8450 as a fine art proofing printer and won't bother about all the other features like print direct from a CF card. Actually this printer is especially interesting for its B/W capabilities. As shown above the one not used cartridge can be parked in a special place above the heads. The black and gray cartridges can be switched at any time (not sure how much ink you lose during that process). If you enter a new cartridge the printer will calibrate itself using a sheet of plain paper. The B/W prints on Photo Plus Glossy paper with the gray ink cartridge are very good if you use the grayscale mode in the driver (see screen shot below). 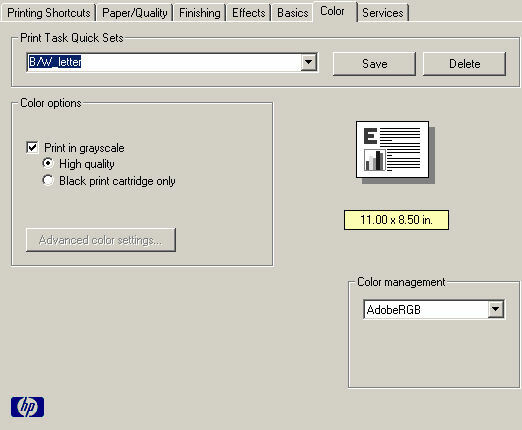 Very good is the fact that the source images can be in AdobeRGB and the printer will honor this setting. This way your preview in Photoshop will be close to what you get from the 8450. You don't have any control on the print toning. This would not bother us because the B/W tone is very nice. Note: The documentation we got was really poor. There was no mentioning how to properly print a B/W image. Under B/W we found only how to install the Gray cartridge. Color prints on Photo Plus Glossy paper are not bad either. But here the profiles delivered by HP seem to be a bit limited as there is no direct support for the Soft Gloss papers (we got pretty over saturated prints on that paper). Most cartridges have three inks. 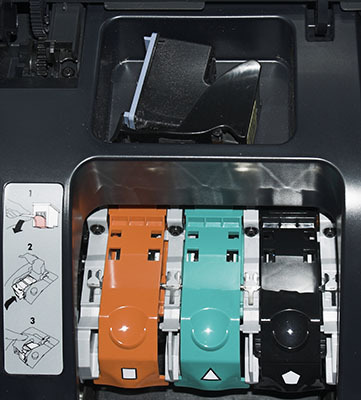 The cartridge has to be replaced if one of the inks is gone (actually the printer will warn too early to replace the cartridge and not find out that only one ink is out (a wasted print will show a missing color or gray). Each cartridge has a new head. This avoids clogging with old heads but also adds to the cost. The HP Photo Plus paper is at the same price level as other highend glossy papers. Overall the ink cost will be significant if you print a lot. We had sometimes the problem that we incidentally hit the print button. Then the next time we booted up Windows the printer was using 3(!) sheets of paper and printed one line of garbled text on them. We think the printer should reset if the PC boots up. Solution: keep the per off the tray when you shut down the printer.